Liberty’s Timmy Gies, left, and James Rogers attempt to block a shot by Orange’s Mason Sears (9) during the first set of Tuesday’s showdown in Lewis Center. 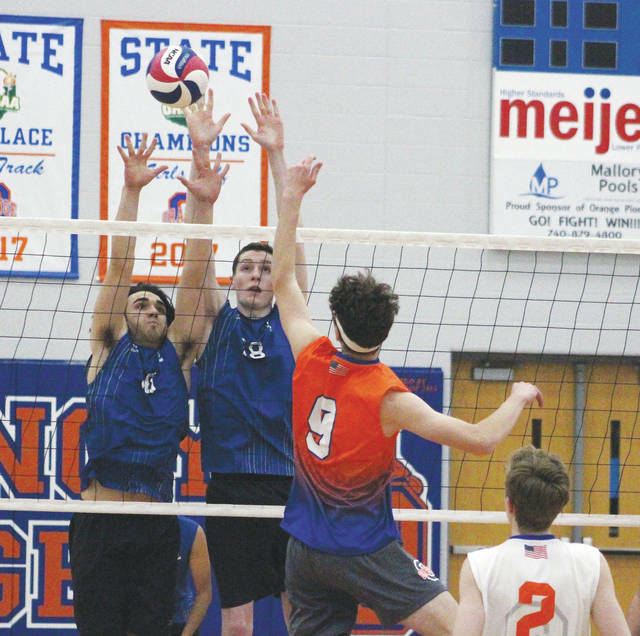 It was a game of firsts for the Olentangy Orange and Olentangy Liberty boys volleyball teams. For Orange, Tuesday’s showdown in Lewis Center was the first home game in program history. For Liberty, it was the first game of the 2018 season … and first win. The Patriots (1-0) started fast and hung on late to knock off the Pioneers (1-1) in three sets. They won the first two by respective scores of 25-11 and 25-14 before sealing the deal with a 25-22 win in the third. Nick Irelan and Llwyatt Hofer led the Patriots in kills with 12 and 10, respectively. Sean McCabe, meanwhile, quarterbacked the offense with 26 assists while Tanish Gandhi, Irelan and Rithvik Potluri finished with 12 digs apiece. The Pioneers were powered by Luke Little, who had 10 kills; Jake Smith, who finished with a team-best three aces; and Lawton Hinely, who had 21 digs in the setback. Sam Cochran was also steady, collecting three kills and 12 digs. The Braves continued their solid start to the season Tuesday, knocking off the host Wildcats 25-2, 25-14, 25-10. Kurt Freeman led Olentangy with seven kills while Mitchell Postak had six. Bentley Azbell anchored the defense with eight digs. Also: Dublin Scioto def. Delaware Hayes 25-23, 25-15, 25-16. Buckeye Valley started its spring trip with a double-dip against host Elmore County (AL) Tuesday. The Barons scored in four of their six trips to the plate in the opener, rolling to a 14-4 six-inning win. They plated three runs in the second to set the tone before breaking things open with a six spot in the fourth. Elmore answered with three runs in the bottom half before getting their fourth and final tally in the fifth, but BV scored three times in the fifth and twice in the sixth to seal the deal. Evan Ulrich, Kyler Lewis and Andy Eurez each had two hits in the win. Ulrich added a team-best three RBI while Travis Pennington, Lewis and Eurez knocked in two apiece. Ulrich picked up the win on the mound, allowing four runs (none earned) on five hits while striking out six and walking two. Elmore won the second game 7-6 in walk-off fashion. Delaware Hayes showed it can win in a rout and in come-from-behind fashion … all in the same day. The Pacers buried Cocoa (FL) 10-0 in the first game of a doubleheader before erasing a nine-run deficit on the way to a 16-13 win in the second Tuesday in Florida. Hayes, which moved to 5-0 with the wins, was down 10-1 heading to the bottom of the third in Game 2. That’s when the Pacers took over. They scored two runs in the third before taking the lead for good with an eight-run fifth. They added five more in the sixth before Cocoa scored three times in the seventh to smooth out the scoring summary. Bobbi Adams had a home run as part of a 2-for-3, two-RBI effort. Other standouts included Haley Osborne, who was a perfect 4-for-4 with two runs and two RBI; Mallory Stonebraker, who was 2-for-2 with a team-leading three RBI; and Amaia Daniel, Lexi Mattix, Chloe Barton and Alex Armstrong, who had two hits apiece. The opener was close until a seven-run fourth made it a 9-0 game. Barton finished 3-for-3 with four RBI while Daniel, Stonebraker, Mattix, Adams and Armstrong each had two hits in the five-inning win. Osborne picked up the shutout in the circle, allowing just three hits while striking out six and walking one in her five innings of action.